With Father in Washington and Cuffy away visiting a sick cousin, almost anything might happen to the Melendys left behind at the Four-Story Mistake. In the Melendy family, adventures are inevitable: Mr. Titus and the catfish; the villainy of the DeLacey brothers; Rush's composition of Opus Three; Mona's first rhubarb pie and all the canning; Randy's arrowhead; the auction and fair for the Red Cross. But best of all is the friendship with Mark Herron which begins with a scrap-collection mission and comes to a grand climax on Oliver's birthday. 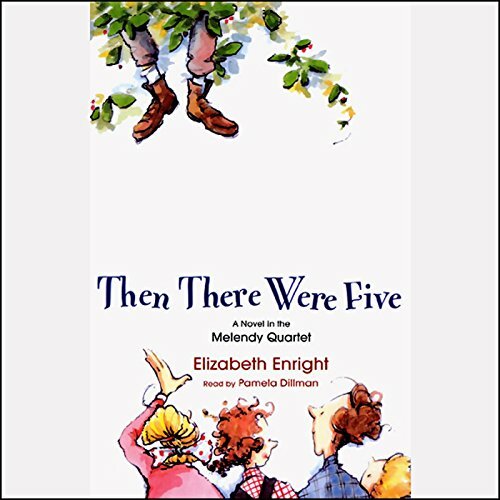 Here is Elizabeth Enright's story of a long and glorious summer in the country with the Melendy family. ©1944 Elizabeth Enright Gillham; 1972 Nicholas W. Gillham, Robert Gillham II, and Oliver Gillham (P)2004 Listen & Live Audio, Inc. Independent Curious & Sensible- love these kids! Yes. The kids in this family are great role models for kids today. What was one of the most memorable moments of Then There Were Five? When the kids helped the young boy living with his mean uncle to escape and have fun times. What does Pamela Dillman bring to the story that you wouldn’t experience if you just read the book? She puts less familiar words into context making it easier for younger kids to understand. There were many suspenseful moments and my daughter admired the courage that each kid showed. The whole series is well worth listening to- we have listened to several of them! Highly recommend! Father was in the office he told the Melndie children that Mark might not want to be adopted and then the children got excited so I think you should have said all adopt Mark if you wants to. Wonderful, complex characters; and fun and engaging dialogue that rings true. My children (aged 5-12) and I were all spellbound. Every book in this series is quality. The narration is also excellent, very smooth and unique for each character without being ridiculous or distracting. These books are fun for the family. My 11 yo son loves them. The readings are expertly done. Love the series and this book especially. As does 3 generations of my family. However, the chapter on Rush and Mark's adventure in the woods with Oren Meeker and his friends at the still is badly recorded. At least just this one section of that chapter is screechy and skips. Since this was recorded (very well by Pamela Dillman) over a decade ago, I doubt that anything can be done about it, but Audible need better monitoring before releasing. Thanks!